I agree with you. Keeping in good shape and healthy life will be a good idea to keep. I also try to get good life with healthy living. I know what you mean about sleep, I wouldn't sleep at all if not for meds. I admire your commitment to stay healthy. I don't date so can't really comment on that, but do love taking walks. Maybe I'll start doing that too. Good for you, Launna! Keeping yourself committed and motivated is hard but also so rewarding! I think once you set your mind to your goals you will do fantastic! You are great when it comes to committing to your changes. I understand that you don't want to share your dating info until you feel like it is getting somewhere. It hurts when someone rejects you no matter how good your self esteem is. It just isn't fun to feel rejected. I hope the exercise helps with the sleep issues. Good morning dear launna yeah run and massage may make you rest better than before. These are great goals Luanna and I know you can achieve them if you set your mind to it. you can do it! I made a similar commitment - just got a new iPhone app to keep me accountable. I'm trying to lose more weight this summer. stay strong, L! I totally agree with you dear: first of all health!! You're doing a great job with yourself ... keep it up! And then self-esteem is fundamental: it is what allows us to move forward in the best way! You have made so much progress that we are sure that you can keep on track. We all slip back from time to time in everything we do. One has to remember that we are all human, after all. But, eating healthily and taking exercise are relatively simple ways in which we can be kind to ourselves and to our bodies. We have to cherish our body as it is the only one we have! Good luck with keeping to your goals. Sharing them in public us certainly a way to keep up the commitment! You have to exercise to stay healthy. I am a passionate about fitness. I go to the gym at least 2 times a week. You have done a lot to keep your body fit. I have got impressed in the way you have taken effort for doing exercise. So don't leave them in middle. I have started doing exercise by seeing you. So have a track in your life! Time for goal reaffirmation. Do not let yourself go slack on that one. And the CPA bit... All the best for that one. I used Lose It for a while. Those apps are awesome! I had one of those fitness tracker bands (Jawbone Up) but it malfunctioned after 3 months. I exchanged it and the one they sent back wouldn't charge after a couple of weeks. I tossed it in a drawer. I pulled it back out again yesterday and now I can't find the charger! Oh well...should've bought a Fitbit Flex, I guess. I really agree with you. Health is very important for us and the sport is amazing for the health. So you've to exercise to stay healthy sweetie. Wow, really good Launna! I agree that it is good to live healthy. I have heard a lot of good things about My Fitness pal. Will have to check it out. good job on staying on track with your health. Sounds like you have your head on straight and have figured out the right course! Great goals! You've come too far to go back now girl. If it was easy to lose weight an keep it off, everyone would be at their perfect weight. As you said, it takes a decision to be healthy and a commitment to do what it takes to stay healthy. Hi my wonderful Launna, Your post is so inspiration, at least me. I used to be eat healthy and exercise everyday, since my twins, I do my best as I can. Your posted put me in the mood to walk, as my twins are five now, I took them to go for walked with me around ours neighborhoods about half and hour. Thanks for inspired Launna. I will walk along with you here and will keep you posted. 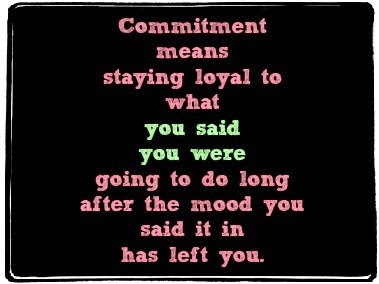 (commitment:),) .... If we were lived closer, I'd love to invite you to our homemade and healthy yet delicious dinner meal:) to thank you for being such a wonderful person on earth ...Glad to hear that you can get some sleep:). I had the good weekend off and spent the wonderful time with my family... Thank you so much sweet Launna. Have a blessed day and week my lovely girl.:). Apps are a wonderful thing...I have several apps on my iPhone related to health. Fitnesspal, Atkins Carb Tracker, Interval Timer...the app possibilities are endless and often free! I think we all struggle from time to time, then we have periods where we are strong and work towards our goals without effort. I just wish I knew how to stay in the "effortless" phase! :-) But the bottom line is as long as we are in the positive more more than the negative, we come out ahead. hugs sweet Launna, and wishes for a beautiful day out there. Amazing post dear!! Congrats for that year of changes!!! I'd like to have a more healthy life too, I'll try it!! I agree Launna! 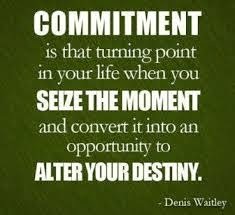 It is very essential to be committed to something we are determined to achieve! You are one of the most optimistic person I've met in my life and I'm so glad I did! Have a lovely day dearest Launna! That you do an anniversary doing changes it's something that you should be proud about. Thank you for your lovely comment, I replied you in my blog also. I had to come to this post to remember those apps you talked about. I want to try them both. 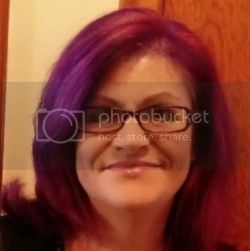 I need to lose 30+ lbs so they may help me. Also sweetie, I have nominated you for the Liebster just because I love your blog as you already know. I am sure you will see it on my blog since you follow me already. I use My Fitness Pal with RunKeeper. It's getting so hot now it's discouraging. I got out at 5:45 to beat the sun. I want to keep walking because the outside walk is where I see the quickest results on toning my legs versus the treadmill. And I'm am more motivated to go outside than stay inside or drive to the gym. Anyyyyyway... ;-) Good for you and all your plans. I'm back to not sleeping again too. For me I think it has to do with being comfortable temperature wise while I am sleeping. I just can't seem to get the thermostat just right. 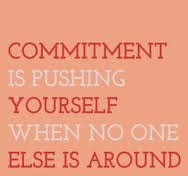 Commitment it something that to many people do not take seriously enough. Wishing you an adorable day! Health is very important and I hope you're doing great now. hi darling have anice day! Oh, it is so hard to commit to exercising..especially, in summer. I'm finding it so difficult to go outside on these humid days. I'm glad to hear you have set some new goals with the dating too. But I would want to write about them too. All the best on your plans. And wishing you sweet dreams too. I keep hearing and reading how I should stay away from all these electronic devices at least an hour before bed. I can't seem to keep that rule. This is such a beautiful and positive article. You right wonderful heartfelt articles everyone can understand. I too feel like I nee to commit more time to me and my health. sweety i wish you a wonderful day!!! Remember that you are a beautiful woman Launna and you can achieve anything you want! Hello Launna! I'm doing well, it's pity that I don't have international giveaways for now, I had one long time ago, sometimes international brands contact me, but not very often. I'm not working now and I don't earn money because of the blog, so I don't want to spend money in the blog. Have a great day!! And today I went to walk with a dog!! I am committing myself to getting up an hour earlier than my son in the morning to do yoga or pilates 5 days a week. That is all I can commit too though as I can barely do the rest of the things I need to do anymore. LOL! Have a great rest of the week dear! I wish you good luck on this and know you can do it after all you did before!!! Wishing you more than a blessed day Launna.:). Happy seeing you on my blog:). enjoy your walks and an exercise:). Good night from me:).. Kisses..
Launna, you've done it again. Time and again your words more than just inspire me. Being healthy is the most important thing, because when you are not, it makes every little problem so much more difficult to overcome. You are doing great! Good for you for re committing. It is hard not to have times when we get lax but never giving up is the key. Love the quotes you have here so fitting! But you look very beautiful already! Glad to hear you're getting back into walking and eating right. I've heard that the dye run is a blast! Be sure and take LOTS of pictures for us!! So much respect each time. The quote about commitment and what you start doing after the mood you made it in has left you is just so true and describes it perfect That is hard requiring dedication and courage. I also know how much damage to self worth and esteem can put things back. I am pleased you have self worth and can fight back. I am yet to reach that point. Right now any form of rejection sends me to lie in bed all weekend. I really admire you.your determination is so inspiring .For me i keep on giving up on exercising i geuss am just lazy.Hope you actually reach your target. staying focus can be tough so reading your determination is great. Stay strong Launna, stay focused....and in the words of an old man who told me everyday for a long time, inch by inch anything is a cinch. Hugs. Good girl! I'm glad to hear you're recommitting to yourself and your health. É muito bom ler que você está animada para cuidar de si mesma! Continue assim, que esse é o caminho certo! Such an inspirational post as always, Launna :) I think everything is possible with persistence and a positive mind, that's why I'm sure you will achieve all your goals! Hi my wonderful Launna. Thank you so much for the weekend dropped over:). I'm having the good time with my husband and my children all whole weekend time:). We've been teaching the kids working on our summer garden:).and then they will be earning the points for doing their hard works:). How about you? Hope things are going good for you in the moment:). Enjoy the rest of your weekend with your daughter Launna. Take care and blessed. Wishing you an adorable week. My wonderful Launna. I'm glad o hear that you and Valentina were had the lovely weekend! I can't wait to hear more about your week:). I'm pretty much busy, I'm having my parents in law comes in town to visit us! I wish your day is as wonderful as you my lovely Launna. Hi dear Launna, I know that sometimes is hard, but I think you can succeed! You write so well. I love to read what you write. Gives me motivation!